Owners & tenants, you need to read this…. 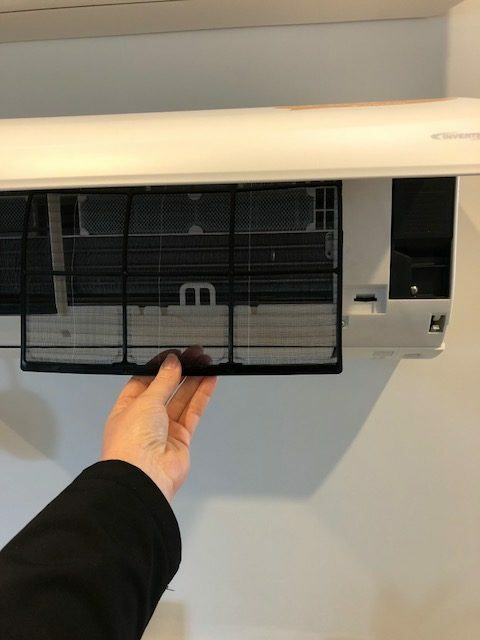 If you have a split system or ducted air conditioning in your home you should be cleaning the filter at least every couple of months or more frequently if required. WALL-HUNG SPLIT SYSTEM: Simply lift the casing from the bottom 2 corners towards the ceiling, you will see 2 large plastic filters (about the size of an A4 piece of paper -see picture), flick them out of their housing at the bottom and gently drag downward – the dust will all be on the final section where the A/C breathes from, so be careful not to get a faceful. If there is a long skinny paper filter on the back remove this before washing the large plastic filter in the kitchen sink, then dry it with a hairdryer or in the sun before putting it back. DUCTED SYSTEM: Locate the return air filter (usually in the hall wall or ceiling) it is pretty large, approx 40cm x 80cm-1.2m. Open the door and remove the filter (slide out) gently vacuum and replace. If the system has reminded you to do this, just re-set the reminder by holding down the “clear” button for 4 seconds. Concealed Daikin BULKHEAD SYSTEM: Locate the return air filter (usually beside the supply air grille, or sometimes below or behind the unit.) One grille will have a filter, raise the vacuum to the grille and gently vacuum it clean, or call us and book in a service call. In the event of a fault, power surge or outage you may need to re-start your Air-conditioner. This is simple to do, resolved the issue 80% of the time and will save you a service call fee. Locate your house’s electrical switchboard (where the “smart meter” is) and look for the circuit breaker marked “A/C” or “Aircon”. Flick the switch to the OFF position and leave for 10 minutes. After 10 minutes, return and switch ON. Now return to the wall controller inside the house and use as normal. Remember, if your system has zones, turn off the zones on the rooms you are not using and close the doors, this will have less demand on the machine and reduce your running costs, it will also help the machine reach the required temperature quicker.